No matter what brings you to Jonesboro, trust Shofur to schedule the perfect transportation accommodations for your group. We’re experienced in arranging travel for groups of all types, making us your #1 choice for your next trip. Call our 24-hour staff to start planning today! From school tours and events at Arkansas State University to local corporate gatherings, weddings, field trips, and more, Shofur is your #1 choice for group transportation to Jonesboro. We’ll find the perfect charter bus for your group and pair you with an experienced driver you can trust, no matter where your travels take you. Call our 24-hour team today at 1-800-436-8719 to get started on your trip planning and to learn more about our services! Planning a business gathering in Jonesboro? Book a minibus to efficiently transport employees and other important guests between venues. You’ll enjoy a personalized shuttle service catered specifically to your group, which will help attendees arrive on-time to your corporate event. You can also transport attendees to nearby restaurants and other popular attractions in a streamlined manner, ensuring that no one gets lost or left-behind during your stay. We’ll match you with a professional driver who will provide reliable rides to every passenger throughout your stay in Jonesboro. Schedule reliable transportation for your wedding in Jonesboro with a private bus rental! From the hotel to the ceremony to the reception, everyone will enjoy streamlined travel to all of your wedding events. Don’t let guests get left behind or leave them to walk, drive, or call their own rideshare apps-- with a dedicated shuttle bus, they’ll arrive right on time to every event with ease. At the end of the night, your bus driver will ensure that everyone returns to the hotel safely. Tour Arkansas State or take your students on a field trip with a private bus rental. Whether you need a small bus for a group of high-school students or a full-sized coach for your elementary class, we’ll make sure you’re matched with the right vehicle for a comfortable, informative, and educational trip. Explore campus to get to know your possible future home, or take your students to on-campus educational stops such as the University Museum or the Bradbury Art Museum. No matter where your trip takes you, your professional driver will make sure all students travel safely and efficiently throughout the day. If you’re looking to transport team members or fans to an Arkansas State sporting event, rely on Shofur to find the perfect bus for your needs. We’ll make sure athletes travel in comfort with plush reclining seats, entertainment add-ons, and plenty of storage space to store equipment and stretch out on board. Or, book a bus for your group of dedicated fans and head over to a Red Wolves game. 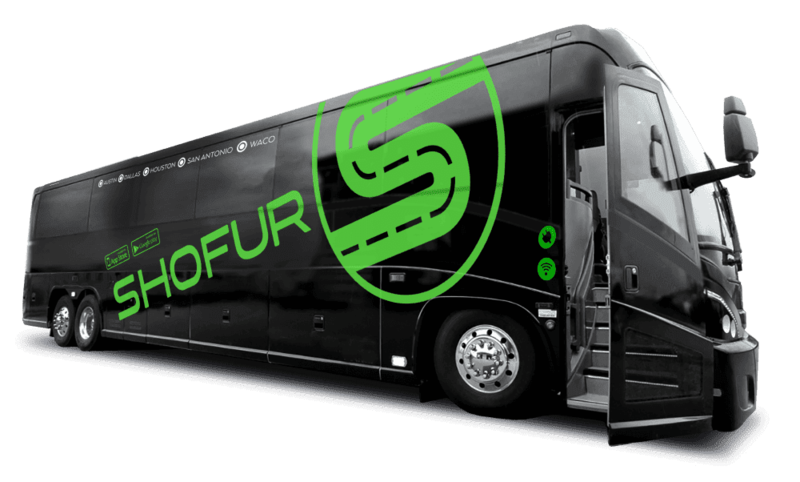 Arrive together and on-time to all sporting events with personalized travel from Shofur. No matter your transportation needs in Jonesboro, Shofur’s team of dedicated reservation specialists will find the perfect bus for you. Call us today at 1-800-436-8719 to get started on your rental process and book your perfect travel accommodations!